Karlsruhe, Germany, October 25, 2018 – EIZO GmbH today announced the CuratOR EX5841, a new 58" monitor that achieves faithful representation of surgical images. The monitor offers a resolution of 4K UHD (3840 x 2160 pixels) and is designed for use in endoscopy and the operating room (OR). The EX5841 uses an LCD panel with energy-efficient LED backlight, a brightness of 500 cd/m2, and a contrast of 5000:1. It displays detailed high-definition images from 4K endoscopes and surgical microscopes. 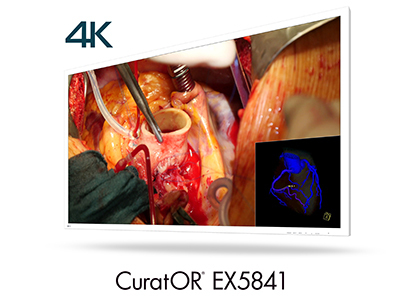 Full HD images from conventional endoscopes and surgical cameras are shown without delay on the full 4K UHD screen. The LCD panel enables a very high viewing angle and high brightness. The EX5841 provides a flicker-free picture even with low refresh rates, which fulfills the strictest ergonomic requirements. In addition, the monitor is equipped with a protective screen that shields the LCD screen against shocks as well as scratches and dirt. The front is protected against foreign material and splashes with a protection class of IP45, and the entire device has protection class IP32. In dual source mode, two different signal sources can be viewed on the monitor screen simultaneously. With the PaP (Picture-and-Picture) function, the two images are displayed side-by-side, and with the PiP (Picture-in-Picture) function the second image is shown on top of the main signal. The size and position of the display window is adjustable with PiP. In triple source mode, three signal sources can be displayed on the screen. The monitor supports various video input and output signals in order to connect various types of modalities. In addition, a communications interface enables image switching using external OR equipment. With 12G-SDI (BNC), DisplayPort 1.2, and HDMI, 4K UHD signals with up to 60 frames per second can be displayed on the monitor using a single cable. A locking mechanism prevents the DisplayPort and 12G-SDI (BNC) cable from loosening accidentally. 12G-SDI (BNC) has stable transmission over a distance of up to 30 meters. Various settings can be saved in the monitor as presets, such as the selection of video input and brightness, grayscale display, color space, etc. The user selects these with the designated preset button. Visitors can see the new monitor from November 12 to 15 at the EIZO booth in Hall 10, stand number H41 at the Medica 2018 trade show in Düsseldorf, Germany. The EX5841 will be shipping in the first quarter of 2019. The date of availability may vary by country, so please contact the EIZO group company or distributor in your country for details. EIZO GmbH is based in Karlsruhe, Germany and is a leading manufacturer of visual display solutions for medical imaging applications. The company portfolio includes color and grayscale monitors of 1 to 8 megapixels, video management systems and related accessory products as well as individual products and complete solutions for the operating theater field. EIZO GmbH is a subsidiary of EIZO Corporation, a global leader in the manufacture of high end monitors for medical and graphic design applications, financial trading, and other markets.